The Heavenly Temple was constructed by Emperor Chengzu, who also constructed the Forbidden Palace. It was later upgraded by Emperor Jiajing during the 16th century and renamed to the Temple of Heaven. The other three major temples in Beijing: the Temple of Earth on the north side, the Temple of Moon to the west and the Temple of Sun to the east side, were also constructed under order of Emperor Jiajing. 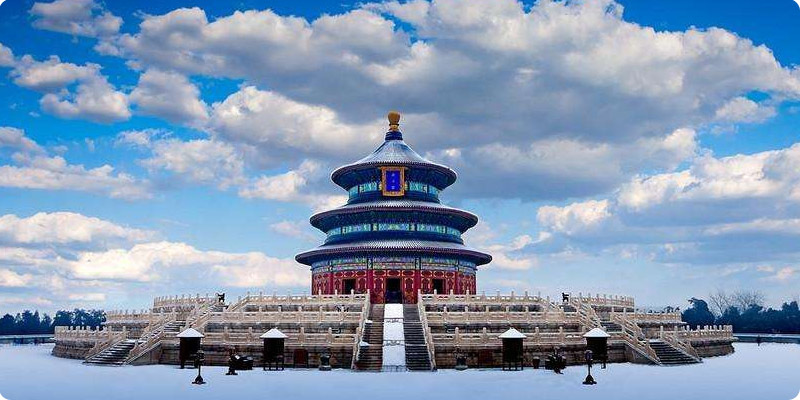 The Temple of Heaven was renovated once again by Emperor Qianlong in the 18th century. As the state budget grew smaller, they no longer had the power to invest in spectacular civil architecture, so renovations halted up until the modern day. During the Second Opium War, the temple was commandeered by the Anglo-French Alliance. Again in 1900, the temple was taken over by the Eight Nation Alliance during the Boxer Rebellion. This occupation lasted one year and caused severe damage to the buildings and gardens. It is also rumoured that the Eight Nation Alliance plundered many of the historical artifacts from the temple. After this desecration, the temple was left unattended to for years, and several of the internal roofs collapsed in. Then when Yuan Shikai made his bid to be declared Emperor in 1914, he held a Ming dynasty style ceremony at the temple, before it was turned into a public park and reopened in 1918. UNESCO declared the Temple of Heaven as a World Heritage Site in 1998, calling it a “a masterpiece of architecture and landscape design which simply and graphically illustrates a cosmogony of great importance for the evolution of one of the world’s great civilizations”. The buildings on the temple grounds are organized into three major groups, laid out over more than 600 acres of parkland, each with their own unique style according to their spiritual significance. The Hall of Prayer for Good Harvests is one of the newest constructions. After being hit by lightning in 1889, it was set alight and burned to ashes because it is constructed entirely of wood. The building was promptly rebuilt after unfortunate occurrence. It is a circular building, 36 metres wide and 38 metres tall. It has three tiers of spectacular blue glazed eaves that form a spire topped with a giant golden bauble. To the south, across the 360 metre long boardwalk called the Vermilion Steps, there is a similar building that is slightly smaller, with only a single-tiered roof called the Imperial Vault of Heaven . The smooth wall of this vault is called The Echo Wall, because it is designed to amplify sound so that even a whisper is clearly audible to anyone in the building. The site’s most prominent building is the Circular Mound Altar , which is built atop three giant platforms of marble stones, lined with stone fences, decorated with elaborately carved dragon figures. The design of this altar has deep spiritual significance, with the number of flights of stairs being the sacred number nine, and other the number of other repeating elements strictly equally a multiple of the number nine. At the centre of the mound altar is the Supreme Yang or Heart of Heaven , where the Emperor stands to pray. The resonance of the of construction is designed to channel the prayer up towards Heaven. It is important to understand that much more so than in other civilizations, the Emperor of China was considered to be the Messenger of Heaven. This is why such an elaborate network of temples needed to be constructed to help the Emperor channel his prayers for the people and receive the heavenly edicts. To this end, the Emperor would camp in the heavenly temple with his retinue twice per year. During this secret ceremony, which was barred off to regular civilians, the Emperor and his men would abstain from eating meat, wear special robes and pray to Heaven for good harvests. The ceremony was planned precisely, such that it was completed at the exact moment of the winter solstice, the shortest day of winter, or summer solstice, the longest day in summer. Any mistakes in the schedule were believed to cause bad luck in the coming year. In ancient Chinese symbology, Heaven is represented by a circle and Earth by a square. The temple layout often consists of circular structures within squares, representing the presence of the divine in the construction. For instance, the Circular Mound Altar and Hall of Prayer for Good Harvests are both round structures built on square yards. The Outer Wall surrounding the Temple of Heaven is semi-circular on the north side, and rectangular on the southern end. As we hinted at earlier the number nine is sacred in Chinese spiritual belief. This is because even numbers are considered the yin, while odd numbers are considered to represent the yang. Therefore, nine, being the largest single-digit odd number , is considered the most yang. Nine is also the number of the dragon. This explains why the Circular Mound of the Altar has fences decorated with dragons. It also explains why The Heaven’s Heart Stone in the centre of the mound is surrounded by concentric sets of flagstones, with 9 in the closest circle, 18 in the next, 27 in the next, and so on such that the ninth circle has 81 stones. The four inner pillars of the Hall of Prayer for Good Harvests represent the four seasons. The twelve middle and outer pillars represent months and hours. The circular pillars are also an example of circles within circles within squares, representing the particular spiritual significance of the middle of the Hall of Prayer relative to the earthliness of the outside world. There are seven stones placed to the east of the Hall of Prayer for Good Harvests, one for each of the peaks of the Tiashan Mountain. The tiles on all of the buildings are glazed blue, because blue is the colour of Heaven. The entire parkland around which the temples are set is about 660 acres in area. It contains playgrounds for children, and exercise equipment for adults. Local people often bring their families to these parklands to play and relax, and you will sometimes see small singing and dancing performances in the pagodas around the park. The parkland is open from 6am to 10pm every day, while the various site inside open at 8am and close for entry at 4:30pm between April 1st and October 31st. They close a little earlier at 4pm between November 1st and March 31st. Tickets are available on site for a small fee. The site is accessible by each of its four gates. Below there is a list of the bus or subway train routes that take you closest to a particular gate. By bus on Beijing Routes 6, 34, 35, 36, 106, 110, 687 or 707. By train from Beijing Subway, Line 5 from Tiantandongmen Station. By bus on Beijing Routes 25, 36, 39, 208, 525, 610, 685, 686, 723, 827, 829, 957 or 958. By bus on Beijing Routes 36, 53, 120, 122, 208, 525, 610, 958, 特3, 特11, 特12 or 运通102. By bus on Beijing Routes 2, 15, 17, 20, 35, 36, 69, 71, 120, 203, 504, 707, 729, BRT1 or 特11.